The prices for mobile data has been dropping with each passing year, but it must be said that telcos in Malaysia are still charging quite a bit for us to stay connected when we are on the move. With that said, Digi Postpaid Plan customers have an interesting proposition that could provide 10GB of mobile data for just RM10 a month, thanks to something called GBoost. Each telco has its own formula when it comes to data quota for their customers. 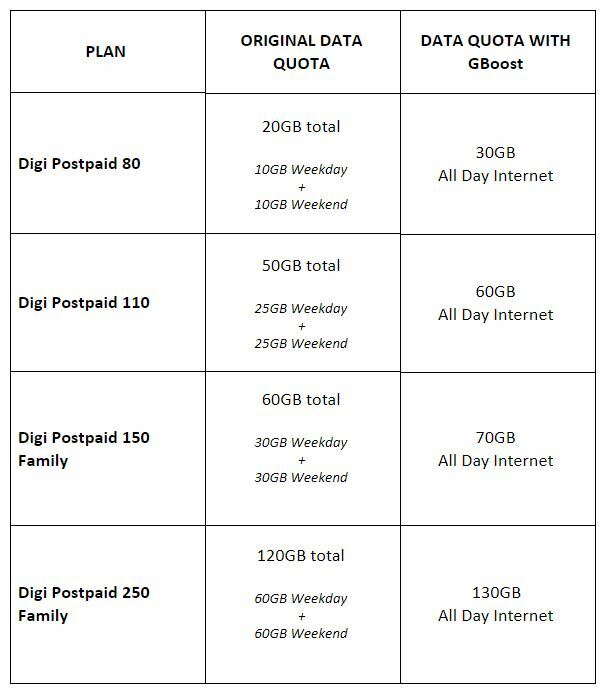 Digi Postpaid Plans currently come in the form of separate weekend and weekday quota. With GBoost, customers can now choose to merge the two quotas into a single, huge data allocation. Moreover, GBoost also adds another 10GB into the data allocation that customers are able to enjoy at any given time. This seamless availability of data allow GBoost users to no longer have to keep monitoring their usage over the course of the week. Finally, the additional data provided by GBoost for Digi Postpaid Family plan subscribers is sharable among the free family lines. 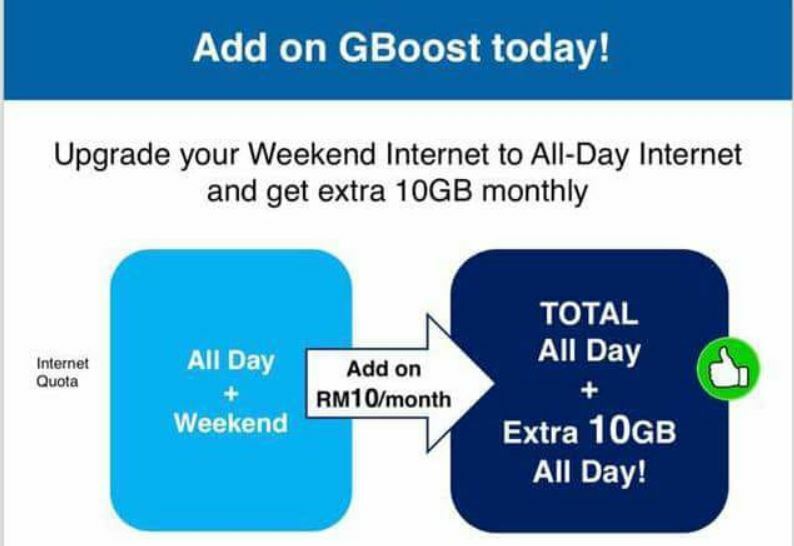 Since GBoost is priced at RM10 per month, customers will receive the additional 10GB data for just RM1 per GB. The Digi Postpaid 80 plan, which only provides 3GB of data, is slightly cheaper than getting the separate Internet Top Up which costs the same. On the other hand, Digi Postpaid 110 customers are able to purchase the 10GB Internet Top Up for the same price of RM10 but they will not be able to utilise the unified data pool without GBoost. The savings are even more noticeable for Digi Postpaid Family customers since the 5GB Share Internet Top Up already costs RM 15. Furthermore, they have to fork out RM25 if they want to have 10GB Share Internet Top Up instead. Finally, in line with Digi’s Borderless Connectivity goals, Digi Postpaid customers can enjoy seamless connectivity for home and abroad. In 10 selected countries, all Digi Postpaid customers can use their Digi Postpaid plans overseas – and even make calls to these countries from Malaysia – for a nominal charge. All in all, GBoost is an interesting way for Digi to deliver flexibility to its postpaid customers. GBoost not only allows customers to unify their plans’ data quota but also enable them to obtain additional amount of data at very attractive prices. 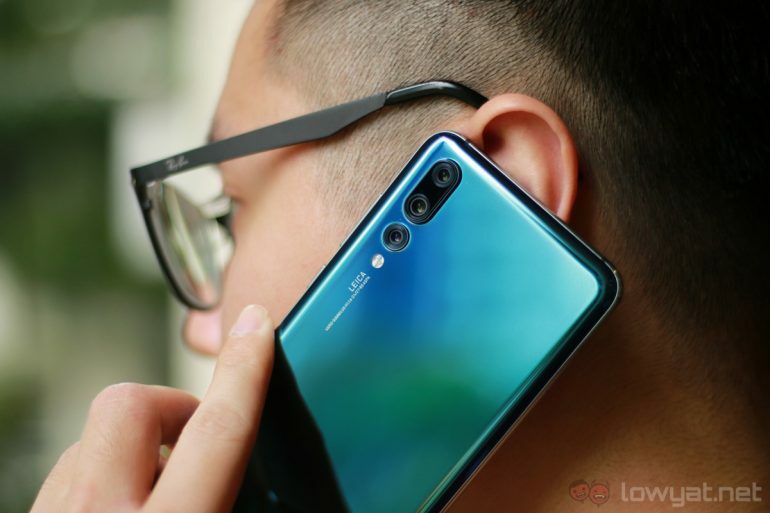 Now that Digi has announced its postpaid bundle for the new Huawei P20 and P20 Pro, find out how you can add even more value to the exciting new phones with Digi GBoost here. Disclosure: This article was sponsored by Digi.